A book about maps with no maps. A disappointing read, almost painful at times, and a missed opportunity. There is useful content here but it is poorly organized. The book reads like a series of rambling lectures. The text is verbose and repetitive; brace yourself for frequent appearances of the phrases, ‘as noted’, ‘as we have seen’, and ‘as I have explained’. Was there no editor for ‘Revenge’? And forget about using this book as a reference text for there is no index. Much space is given over to describing national and geographic features since fewer than 10 maps are included, one of which is a map of the Persian empire in 500 BCE. 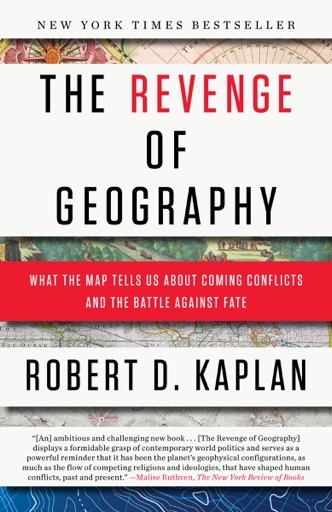 And the book is mis-titled: it should have been called ‘The Revenge of Geography and History: What History and the Map Tells Us About Coming Conflicts and the Battle Against Fate’ since lengthy portions are given over to historical precedents dating back millennia. I was looking for a useful text on contemporary geopolitical trends but I am still looking. Kaplan's is not the one.